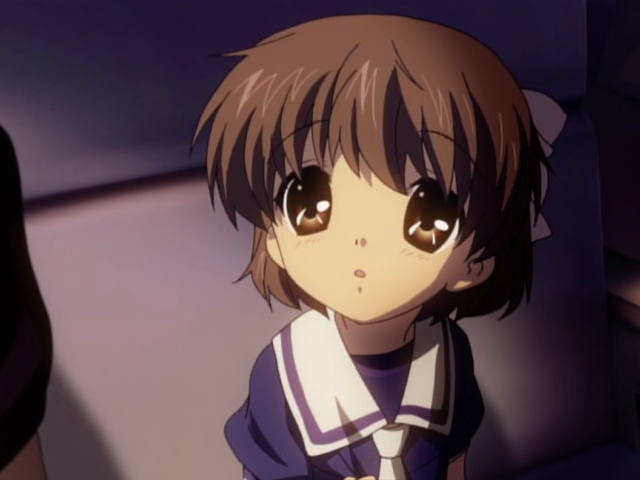 For those who recall my first article on Clannad, you will recall that I wanted to wait for After Story to make a full judgment on the series as a whole. Well, on the flip side, CAS, does answer my questions. Unfortunately, I didn't like the answers I got. WARNING: THE FOLLOWING REVIEW MAY CONTAIN SOME MINOR SPOILERS! It's going to be impossible for me to tell you what I think about CAS without revealing major MAJOR spoilers, but I'll try my best. 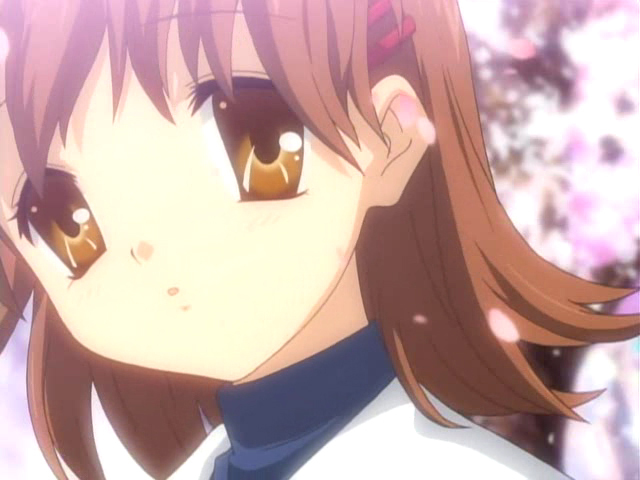 This series takes place almost immediately after the events of the first series. The series is split up like so: "During School" (ep. 1-9), "After School and All is Well" (ep 11-16), "Things Fall Apart" (ep 17-21), "Nauseatingly Happy Ending" (ep 22), "Extra Prequel Episode That Does Nothing for the Plot (ep 23), and "Clip Show" (ep 24). 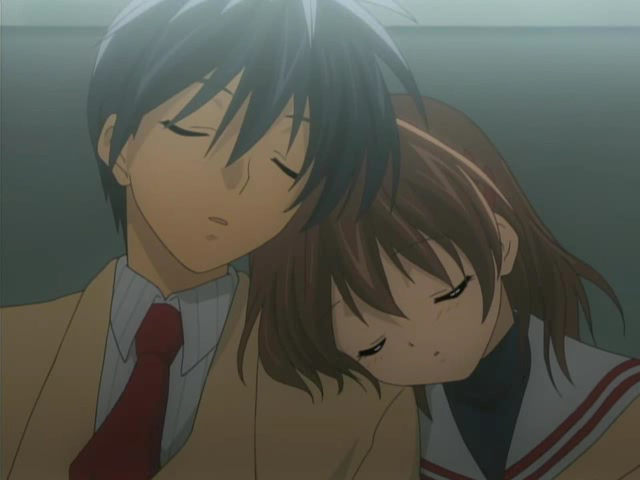 Since I did a quick progress report for the first Clannad, I figured it would be okay to do one for Clannad - After Story. Unfortunately, there's not really a whole lot I can talk about without revealing MAJOR spoilers, so I'll keep it as vague as possible. *ahem*. I have about... six episodes left before the finale of CAS. So far, the episodes have been pretty hit and miss. Once again, my opinion on the series is basically going to depend on whether the ending is good or not. 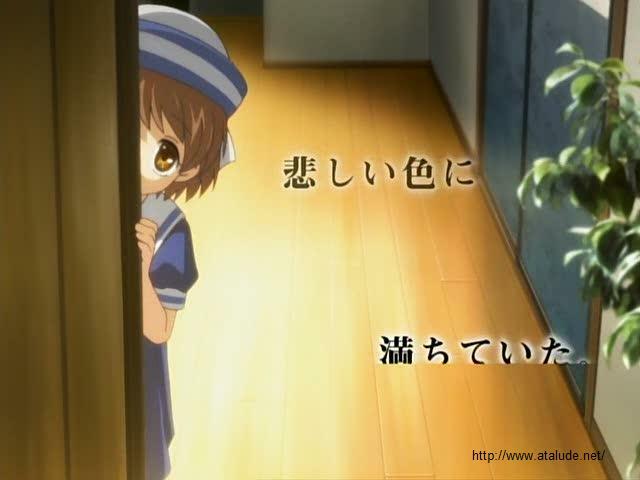 Ushio, possibly the most adorable Anime character I've ever seen. Trying and failing to eat fried rice. She has the ability to make you cry at a moments notice. 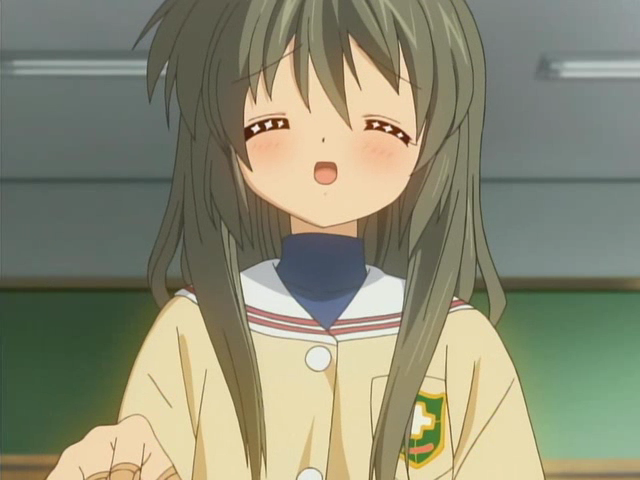 After a few months, I finally started watching Clannad - After Story. So far, they have mini story-arcs about the side characters. That's nice and everything, but I want to see more story about the main character and the main girls. Don't get me wrong; it still seems worth checking out. 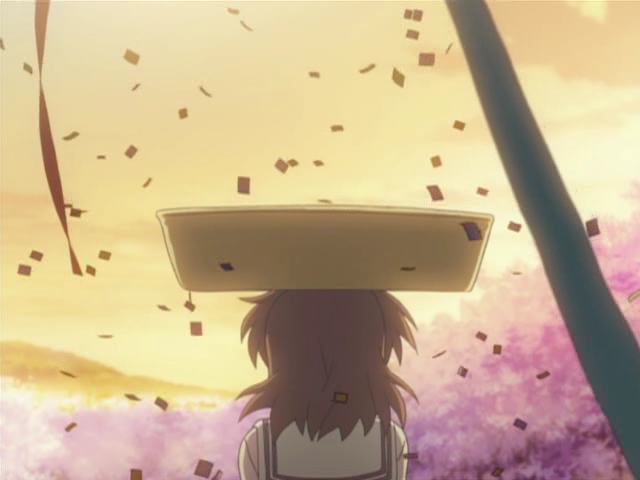 And now, for your amusement, the opening to Clannad After Story. Damn that song is pretty. I think I need it. Now. Fuuko isn't featured as a main character girl... SAD. 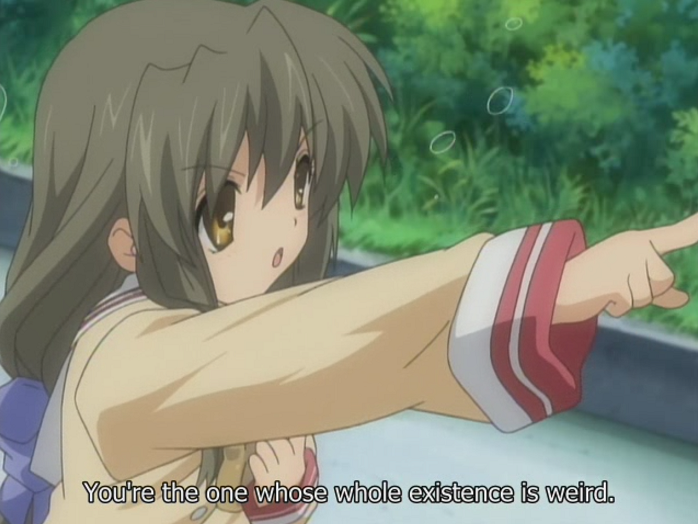 Clannad is, um ... weird. There is no way a town could have this many crazy people in it. 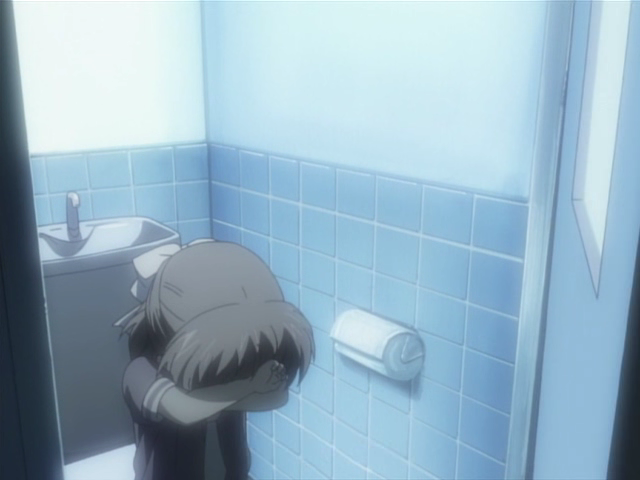 I just finished watching 23 episodes of Clannad, an anime done by the same people who brought us Air, Kanon, and Haruhi. The series is 24 episodes, but the final episode is actually episode 22, and there are two extras after. So I feel okay trying to review this now. Don't look so sad kids, this will be fun... right? 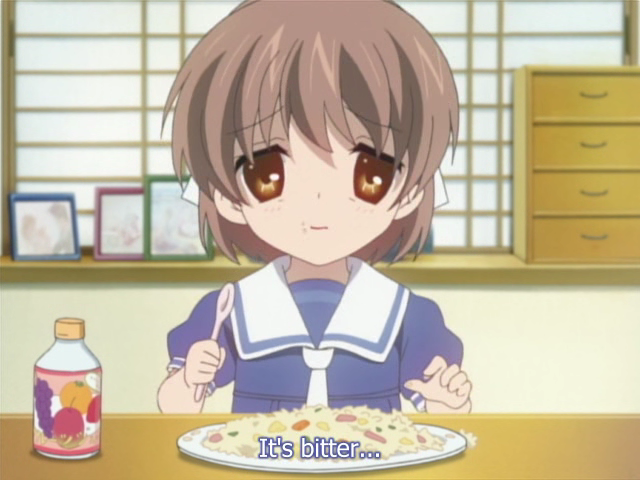 Like it's sister series...es (I don't know the plural of "series"), Kanon and Air, the Clannad anime is based off of a PC dating sim released in Japan only. With that said, the story is set up like a dating sim, something you may have to get past (AKA all the girls heart the main character). If you can get past that, then you've got a good series. 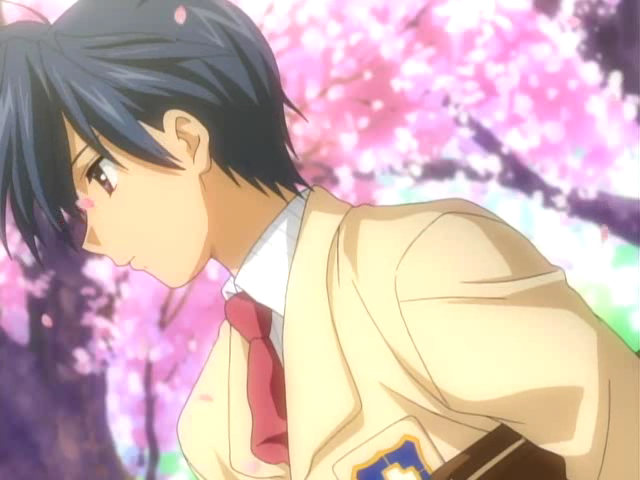 Clannad's main character, Tomoya, is from the ever so creative genre of "Whiney Emo Kid with a Heart of Gold". That's never been done before, right? I'm not going to lie, I found Tomoya to be one of the weakest links in the whole series. Like most anime main characters, his mom is dead and he hates his dad for basically abandoning him (Well, I'd hate his dad too). He used to play basketball, but his dad permanently/accidentally injured Tomoya's shoulder while drunk. Since then, Tomoya has gotten a reputation as a delinquent. 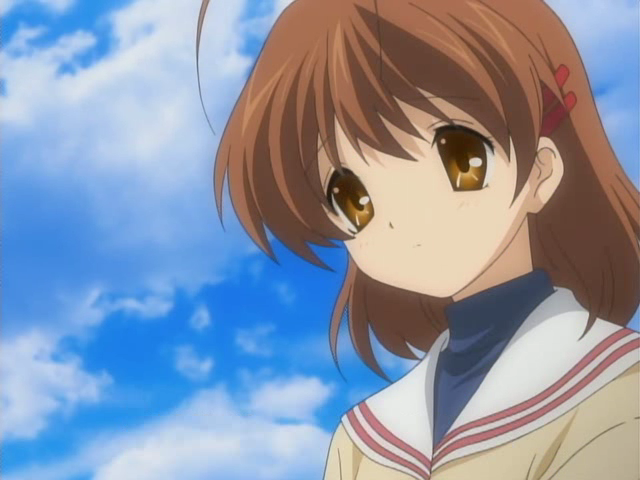 Nagisa, AKA "Right Choice Girl"
The main female character, also known as the girl your supposed to pick in these dating sims is Nagisa. If her nickname wasn't "Right Choice Girl", she'd probably be "Chronically Ill Girl". She missed her final year of high school due to illness, and has to come back one year later. The first person that she meets is Tomoya (she is also the first person he meets) and she clings to him as the only person she knows in school. Nagisa's prime interest in going back to school is to revive the drama club, which was shut down while she was gone due to a lack of members. Ryou (who is not in the opening credits as a possible date) and Kyou, AKA "Short Fused Girl"
The twins, Ryou and Kyou, are a few of Tomoya's friends (there is Sunuhara, but that guy is a douche, so I chose not to talk about him). 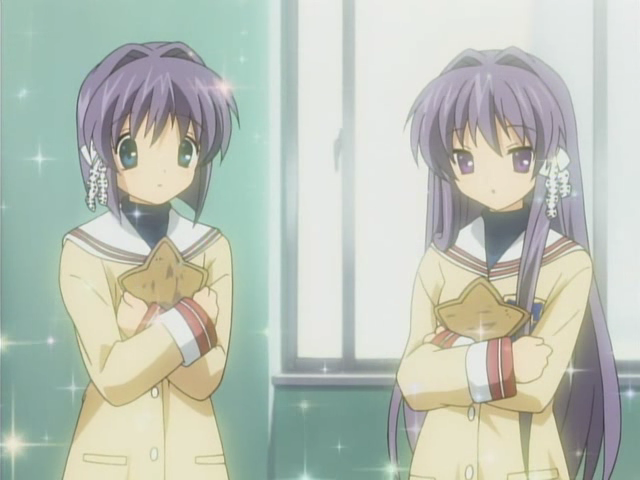 Ryou and Kyou, as it turns out, don't get much screen time, which is too bad because I thought they had the ability to be interesting characters. Tomoyo is a second year student who wants to become student council president. Like Ryou and Kyou, she doesn't get much story time. She does get a story arc, however, though it's only two episodes long. 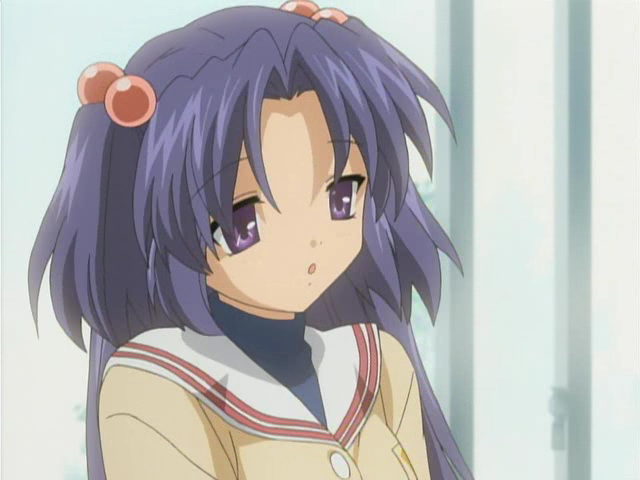 Kotomi, AKA "Socially Akward Girl"
I really liked Kotomi. She's doesn't know how to handle situations with other people. She hangs out in the library, reading books all the time. She takes an instant liking to the main character (as proper form in dating sims). She has a fairly lengthy story arc and it’s not only interesting and touching, but it’s really the only ending that has closure. 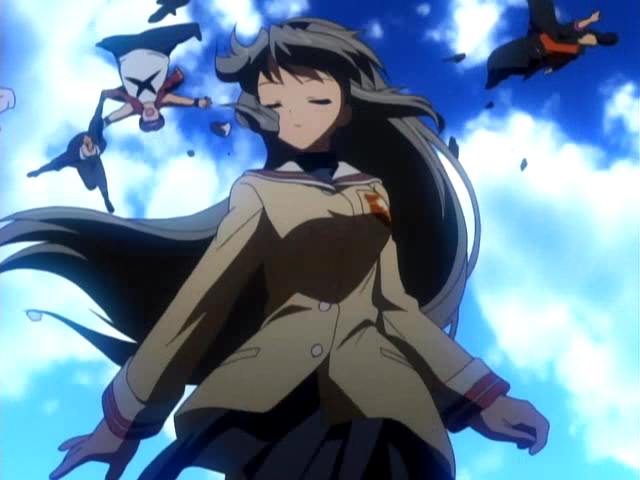 Fuuko is the spirit of a girl who was put in a coma during her first year of high-school (normally, this would be a spoiler, but you find this out within three episodes). Fuuko is cute and determined, and only refers to herself in the third person. Fuuko has the longest story arc in the show, 10 episodes total. However, afterwards, she appears almost at random. Fuuko’s story arc also suffers from never becoming resolved. To be honest, I was disapointed in this series. It lacked the magical feeling that Air and Kanon had. It ended fairly suddenly, and left a lot unresolved (Fuuko's story, Kyou and Tomoyo's story-lines had no substance, etc.) HOWEVER, I found out at the end of the last episode I watched there is going to be a season two, which will hopefully address the concerns. I've seen up to Episode 20 out of 24 (which came to 83.33 percent of the series), and I'm looking forward to the end (in a good way). So far, I can't say this anime has captured my imagination as much as it's sister series, Kanon, but I really enjoy it (if it ends well, it may make my top 10 favorite anime list). I'll make sure to give a more detailed report when the series ends.